This in-line fuse holder is designed to make the addition of fuses to DC motor, battery or controller circuits as quick and easy as possible. Simply connect the two leads of the actuator, motor, controller or similar to the screw terminals at one end and to the load or input at the other end. The fuse holder is intended for 'mini' size automotive blade fuses, 8 of which are included with each set. 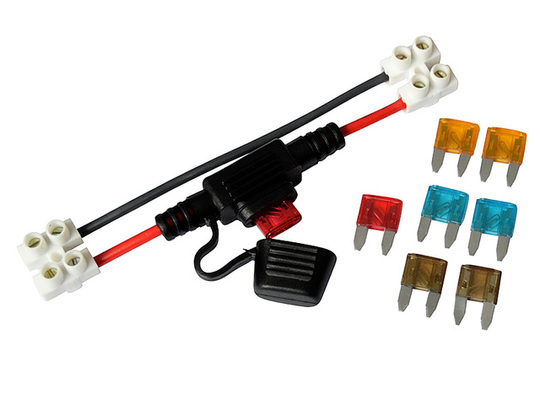 The included fuses are: 2pc 5A (yellow), 2pc 7.5A (orange/brown), 2pc 10A (red), 2pc 15A (blue). Please read on below for more information. The fuses are rated for (and marked with) the current that they will continuously pass at room temperature without blowing. You should generally use a fuse rating of around 125% of the expected continuous current, so that the fuse does not fatigue from current surges. Blade fuses such as those on this listing are slow-blow, meaning that it will take a relatively long time for them to go open-circuit if the current rises just above their rating, this makes them suitable for DC electric motors and other fast-changing current loads. For the fuses to blow very quickly the current would usually need to exceed 150% of the rating. Please bear this in mind when selecting a fuse size for your circuit. The length of the assembly from the end of one screw terminal set to the other is 120mm. The cables are sized to be suitable for continuous currents up to 15A. Please ensure that the screw terminals are well tightened with a good contact area on any attached cables. The terminals have flat-head (slotted) screws.